An investigation into allegations of embezzlement by the chairman of Doosan Group, one of South Korea's oldest and largest companies, has been launched by the Seoul Central District Prosecutors' Office. The ongoing probe is targeted for Doosan Chairman Park Yong-sung and 28 of his in-laws who are suspected of having embezzled nearly 14 billion won (US$13.7 million) from Doosan Industrial Development Co., a construction subsidiary of South Korea's 10th-largest conglomerate. Park Yong-sung, concurrently chairman of the Korea Chamber of Commerce and Industry(KCCI), also holds a number of high-profile international positions, including membership of the International Olympic Committee(IOC) and as chairman of the International Chamber of Commerce. Park Yong-sung and his in-laws are accused of having Doosan Industrial Development pay 13.8 billion won due in interest payments on their personal bank loans of 29.3 billion won from company coffers since 1999, according to prosecutors. Park Yong-sung and his family allegedly took out the loan in order to participate in two rounds of new rights offerings by the Doosan company in late 1999, said the prosecutors. The 13.8 billion won represents a five-year interest on the loan. The allegations were made to prosecutors by the children of former Doosan Chairman Park Yong-oh, the 69-year-old elder brother of incumbent chairman Park Yong-sung, after he was expelled from the top Doosan post last month. Park Yong-sung, 65, was named the group's new chairman at a family meeting on July 18. But the elder Park refused to step down, demanding Doosan Industrial Development, a de facto holding company of the group, be spun off to be run by his own sons. 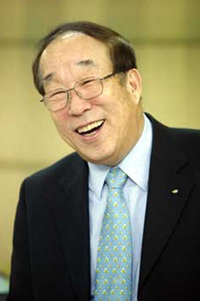 Yong-ho then accused his younger brother Yong-sung of operating a secret fund with company money to manage private organizations and oppress labor unions. Yong-ho and his children have since continued to submit evidence purporting to show that his younger siblings, currently chairman and vice-chairman of the group, have embezzled massive amounts of company funds. In a related development, Doosan Industrial Development admitted on Aug. 8 that it committed accounting fraud in order to inflate sales. The company said it inflated sales from 1995 to 2001 by 279.7 billion won, claiming competition and financial woes caused by Asia's financial crisis in late 1997 prompted it to commit the fraud.